I kept the decoration part quite simple because Yashvi is just 3 and she chose the icing decoration which she could decorate herself. 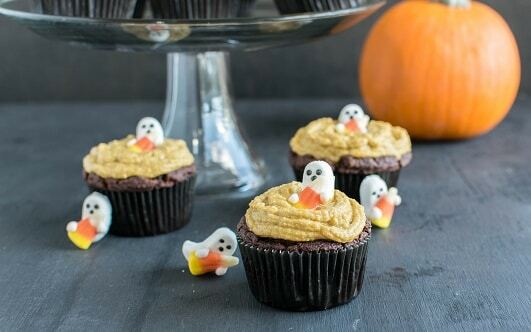 But feel free to decorate these cupcakes as per your choice and make it as spooky as possible. I can however vouch for the taste. It’s delicious and you can’t stop with just one cupcake. In a food processor combine all the frosting ingredients and process as smooth as possible. Pour in a glass container and refrigerate until ready to use. Preheat the oven at 350 degree Fahrenheit and prepare a muffin tray with a greased liner. In a mixing bowl combine all the dry ingredients for the cupcake and mix very well with a spoon until chocolate in color. In a food processor combine banana, oil, vanilla extract and milk and process smooth. Now pour the liquid ingredients into the dry ingredients and mix very well with the spoon until the batter is smooth. Now pour the batter into the prepared muffin tray equally into 9 muffin cups (about 2 tbsp. in each cup). Place the tray in the middle rack of the oven and bake for 35 minutes or until the tester comes out clean. Turn off the oven and let the tray stay in there for 2-3 minutes. (Do not overbake more than 40 minutes). Take out the tray and let it cool completely. Gently take each muffin out of the tray without breaking (At this point they will soft and slight fragile because its pure gluten free). The cupcakes would become firm as it cools down completely. Once completely cooled top the muffins with the pumpkin frosting and decorate with your choice of spooky decoration or enjoy as is. Leftover cupcakes can be refrigerated in an air tight container for 2-3 days. I love your cupcakes they are adorable! I like the idea of adding the pumpkin frosting. how fun and perfect for fall! What a great combination of flavors and so cute too!